Southern Illinois University Edwardsville honored six graduates at the 2013 SIUE Alumni Hall of Fame on Friday, Oct. 4 in the Morris University Center. 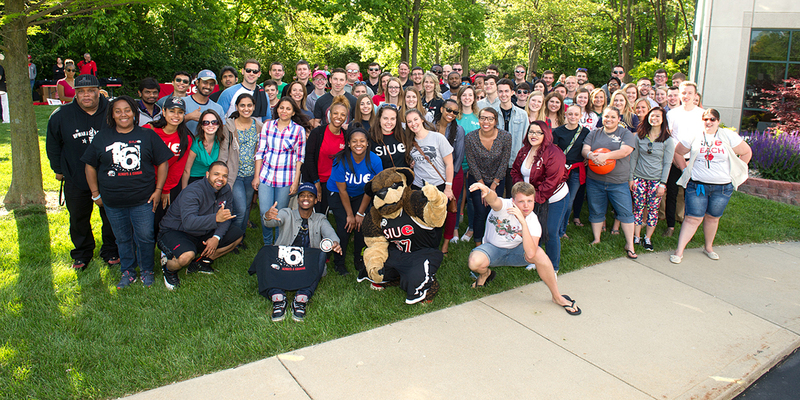 These alumni have achieved notoriety in their respective fields, are role models and are a testament to SIUE’s educational excellence. View the video from the ceremony here. This former classroom teacher has served at all levels of the labor movement including President of IFT Local 763 in Madison, IL; Vice-President of the Illinois Federation of Teachers; Secretary-Treasurer of the Illinois AFL-CIO. In 2000, she became the first woman to be elected President of the Illinois AFL-CIO, retiring in 2007 and being named President Emeritus of the Illinois AFL-CIO. Margaret was the first SIUE alumni to be appointed by Governor Walker to the SIU Board of Trustees. President Clinton appointed her to the Commission of Presidential Scholars. Margaret has served on a variety of boards including the Chicago Council on Foreign Affairs, Unemployment Insurance Advisory Board, the Illinois Women’s Institute for Leadership and the Board of Trustees of the Global Solidarity Center. She has been recognized with the Labor Leader Award from the Labor Council for Latin American Advancement, Israel Peace Medal, Protector of Working People Award from the Illinois State Crime Commission, and was the Guest of Honor for Chicago’s St. Patrick’s Day Parade. She was the first SIUE Alumni named Distinguished Alumnus of the year in 1974. Since retirement, she has traveled to countries throughout the world engaging women in efforts to improve working conditions, to become active politically and teaching women about equality. Over 38 years of experience on the design and analysis of complex transportation problems have equipped Mr. Brammeier with a broad range of technical capabilities. As one of the Principals of Crawford, Bunte, Brammeier, Mr. Brammeier has led the firm’s responsibility of project management, technical and design guidance, and overall administration. Mr. Brammeier has managed and participated in many traffic impact studies for developers, with particular expertise in large, regional shopping center developments. He and his staff perform detailed analysis of sites and development plans. The results of these studies are integrated with knowledge of existing traffic flows, capacity and roadway performance to make recommendations regarding the proposed development. Mr. Brammeier leads the firm’s efforts in the design of roads and intersections to achieve maximum traffic flow and reduce the possibility of accidents. Timing, phasing, and synchronization of traffic signal devices are projects typically conducted under Mr. Brammeier’s guidance. Mr. Brammeier has also participated in numerous studies related to the collection of data and recommendations on such issues as traffic safety, school crossings, truck route plans, spot speed studies, signage inventories, and feasibility studies. He has also been involved in various aspects of providing expert witness services for lawsuits with testimony related to a wide range of traffic and transportation issues. At the School of Dental Medicine, Dr. Schmidt was awarded membership in the Omicron Kappa Upsilon Honorary Dental Society and the Pierre Fauchard Academy. After completing a General Practice Residency with the US Public Health Service he continued his education at the University of Washington where he received his MSD degree in Prosthodontics. Dr. Schmidt has lectured nationally and internationally on various prosthodontic, restorative and implant topics. He is the past president of the Pacific Coast Society for Prosthodontics and the Washington State Society of Prosthodontists. As a member and adviser for several study clubs and dental organizations he continues to work toward enhancing the level of dental excellence locally and nationally. For over thirty years, Dr. Schmidt has enjoyed his private practice in Seattle, specializing in fixed and removable prosthodontics and implant restorations. Dr. Schmidt and his wife, Alicia, have three grown sons. Their youngest son, Nathan, has Cystic Fibrosis. Dr. Schmidt and Alicia volunteer with the Cystic Fibrosis Foundation to help raise awareness and funds for research to find a cure for this disease. They have been past presidents and have served on the Washington Chapter, Cystic Fibrosis Foundation Board for over 20 years. Helen proves one person can make a difference. She broke age barriers in the 1960s, attending SIUE as a non-traditional student, completing her education after raising a family. She broke gender barriers while teaching in the “hard” sciences, a field few women pursued. Helen performed biodiversity research working in the rainforest and on the coral reefs of Belize. She taught environmental classes at local colleges, achieving the Master Naturalist designation, continuing her research to improve the environment while educating the next generation. Helen ran several laboratories at SIUE, providing guidance and expertise to hundreds of students. She performed biochemical research at the SIU School of Dental Medicine and Washington University School of Medicine. Her work with the Illinois Department of Health improved water supplies, destroyed mosquito breeding sites and led to the 2004 Lifetime Achievement Award from the Waste Water Professionals of Illinois. That award is now named in her honor. As a founding member of the Meridian Society, Helen has led this organization to fund charitable works across the region. She served in several board positions and continues to recruit and support the society. Helen also served as president of the SIUE Alumni Association in 1993, having served on the Board of Directors from 1986 to 1995. Dr. Elizabeth (Beth) J. Stroble, President of Webster University, is the CEO of the only Tier 1 independent nonprofit university with a network of international residential campuses serving 22,000 students in sixty cities and eight countries on four continents. Since 2009, she has led Webster University’s mission as a worldwide institution transforming students for individual excellence and global citizenship. An academic leader with diverse experiences as an educator and administrator, she began her career as a secondary teacher in Vandalia, Illinois. At that time she completed two master’s degrees at SIUE, one in history and one in American and English literature. Following the completion of a Ph.D. at the University of Virginia, Dr. Stroble progressed through academic and administrative ranks at Northern Arizona University, University of Louisville, and University of Akron to become Webster University’s 11th president. Her leadership has advanced globally diverse and inclusive talent; made strategic investments in new academic programs, facilities, and technology; increased endowments that support student success; completed a comprehensive campaign; advanced institutional reputation and recognition; and strengthened partnerships locally and globally. She is a published author and speaker recognized throughout her career for professional contributions to education, women and leadership and community engagement. After graduating, Mike began his professional career at an international “Big Eight” firm. He then transitioned to a local CPA firm, completing his experience requirement prior to obtaining his CPA certification in 1973. In 1976, he was a founding partner of Teel, Heller & Wenzel, CPAs and in 1982 formed Wenzel & Associates Ltd., CPAs. Mike exhibits leadership and dedication to his community through his involvement with numerous organizations including the Boy Scouts, where he serves on the Board and as a member of the Executive Committee, Assistant Treasurer, Audit Committee member, Budget Committee member and past Treasurer; Camp Ondessonk as a member of the Finance Committee; Main Street Community Theatre, Inc. as Board member and Treasurer. He is also the current Vice President of the Board of Directors of St. Clair Country Club, previously serving as its President, Treasurer, Secretary, and Finance Committee Chairman. Mike is a member of the Leadership Council of Southwestern Illinois,Advisory Board member of Carrollton Bank, and a past Board member and Chairperson of the Friends of St. Elizabeth Hospital. He has been active in his church, Blessed Sacrament Parish, as past Chair of the Finance Committee, member of the Parish Council, and Parish Trustee. He joined the Board of the SIUE Foundation in 2008, and currently serves on the Audit Committee and as President of the SIUE Foundation Board of Directors.